The Micropure Segmented design (shown above) offers significant advantages over conventional filter cartridges. Air or gas flows through the filter media into an adjacent segment. Filtered air or gas exits through openings at the center of the cartridge and out the sterile side of the housing. To reduce batch contamination, spoilage, and product loss, effective sterile submicron filtration is a necessary part of your process. Especially important in the food, beverage, and pharmaceutical industries, sterile filtration protects your product from harmful submicron particle contamination and bacterial transfer or growth. To maintain safe,balanced pressure during the filling or emptying of a storage vessel, tank vent or breather filters are essential to reduce the possibility of contaminating your product. 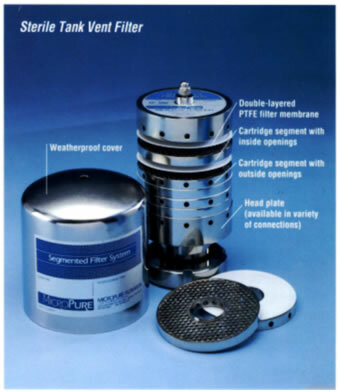 MicroPure Segmented Tank Vent Filters feature a patented design that offers significant advantages over conventional filter cartridges. Self-sealing PTFE membranes with a 0.2 micron retention efficiency for air and gas are sandwiched between perforated stainless steel segments within an stainless steel housing. The independently functioning modular segments are clamped together by a stainless steel tension rod that provides continued support upstream and downstream of the filter membrane. The required cartridge length and diameter are determined by your application. small membrane media are replaced-not the entire cartridge. Case Study: The Ebb and Flow of Brewing Yeast:A liquid yeast producer is adding several new tanks and process lines it is important that the air going in to start the fermentation is sterile, as well as the air transfer during filling and emptying. Case Study: Sterile Vents for Tank Farming: The client has a large tank farm as a part of its new facility with over 75 tanks. There were several major concerns 1. filter life, 2. operational cost, 3. pressure drop at installation and throughout the life of the filter. Case Study: Fixing a Sticky Situation: When a clients filters were clogging too quickly the engineers at Micropure went to work investigating the problem. The culprit ended up being pretty sweet.